Review: One morning, in a small English village, a notice in the local newspaper announces "a murder" that will take place at 6:30pm at someone's house. Neighbors arrive thinking a fun murder game is going to take place. Everyone is excited until the would be "murderer" almost shoots the owner of the house with a real bullet and then seems to commit suicide immediately afterward. Local police are baffled. Luckily, Miss Marple is nearby vacationing and helps solve the case. I figured this one out!! Yay! I knew who the murdered was almost immediately. I didn't figure out all of the exact motives to the crime but I'll still consider it a 'success' on my part. Overall, a good read. 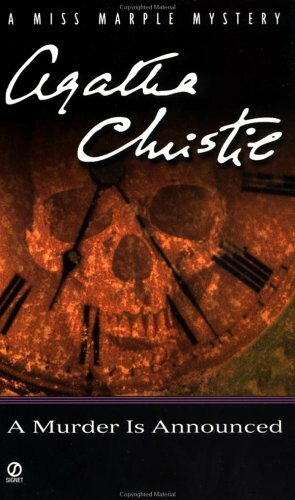 Christie does a great job creating red herrings, although they weren't as strong in this book as others. Miss Marple once again remains in the background. I enjoyed it.